The home of the 12th Man is now home to an impressive 12-minute mark – and in short order, very likely the 32nd National Hockey League franchise. Seattle hockey fans crushed the goal of 10,000 season-ticket deposits within 12 minutes of the opening of Thursday’s sale, which was green-lighted by the NHL. Some 25,000 down payments of either $500 or $1,000 were collected in the first hour, despite an expected arena capacity of 17,500. If there was any question about hockey’s popularity in the Pacific Northwest, there is no longer. Seattle desperately wants NHL hockey, vindicating the league’s long-held fascination with the market. Demand was overwhelming, causing Ticketmaster’s system to crash. All of that occurred before an NHL Seattle flag was raised to the top of the iconic Space Needle on Thursday afternoon to commemorate the launch of the campaign, the latest step in securing a franchise. The Oak View Group, backed by billionaire David Bonderman and Hollywood producer Jerry Bruckheimer submitted a formal application for expansion last month along with a $10 million application fee. With that came the go-ahead to start the ticket drive. The official goal was to bank enough deposits to impress the NHL’s Board of Governors to award a franchise to Seattle as quickly as June. Gary Bettman says Seattle's expansion bid will be awarded based on if it's the right fit for the NHL, and Gary also suggests the NHL isn't concerned about the NBA returning to Seattle or NFL to Vegas. Bettman also discusses the next CBA discussions, and the NHL not going to Pyeonchang. They blew that out of the water and smashed the comparable numbers from Vegas in the process. Fairly or unfairly, almost everything Seattle does in their bid to bring NHL hockey will be compared to Vegas, where everything owner Bill Foley and general manager George McPhee touched has turned to, well, gold. The Golden Knights collected 5,000 deposits in two days in 2015 and maxed out at 10,000 in approximately 90 days. Seattle hauled in two and a half times that total in the first hour. Unlike Vegas, which didn’t accept down payments from fans with a billing address outside Nevada, Canadians were welcomed to open their wallet with the border just two hours away. Seattle hopes to forge a geographic rival with the Vancouver Canucks – and vice versa. “To have a freeway rivalry would be great,” Canucks president Trevor Linden said in December. 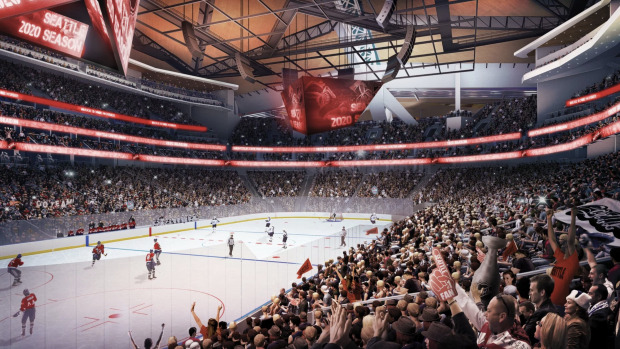 With a $660 million renovation and gut job to Key Arena on track to begin in October, according to Oak View Group CEO Tim Leiweke, play could begin in Seattle in time for the 2020-21 season – if that isn’t derailed by another NHL lockout. The renovation at Key Arena – now called Seattle Center – will be tricky. It involves digging down deep to construct a new foundation, since the iconic roof and three of the four sides of the building are protected by historical designations. The building would be able to accommodate an NBA franchise and Oak View Group has vowed to reserve the SuperSonics’ old colours of green and gold for basketball. The process was quicker in Vegas because T-Mobile Arena was already nearing completion by the time the franchise was awarded. Vegas set an incredibly high bar for an expansion franchise. The Golden Knights entered Thursday night’s action with the second-best record in the NHL and were unbelievably installed as a co-favourite at betting windows (8-1 odds) to win the Stanley Cup, all in their inaugural season. The success of the Golden Knights is actually good news for the NHL’s other 30 clubs, and not solely from a revenue perspective. Their on-ice fortunes signalled to the league that the expansion draft format was appropriate and the same rules will apply to the potential franchise in Seattle. NHL commissioner Gary Bettman announced in December that Seattle will be asked to pay an expansion fee of $650 million, some 30 per cent more than the $500 million for Vegas, and with that could have come more stringent draft terms for current teams. TSN Hockey Insider Pierre LeBrun reported Wednesday that NHL GMs are already preparing and vowing to negotiate fewer “side deals” or draft consideration trades with Seattle as they did with Vegas. Instead, some GMs say they plan to just allow Seattle to take their one player and move along. That 2020 Expansion Draft may be years away still, but after Seattle opened its collective wallet on Thursday, it’s one that now almost seems like a foregone conclusion.